As I mentioned earlier in this post, pinned DataTips are by default saved across Visual Studio sessions (you don’t need to do anything to enable this). 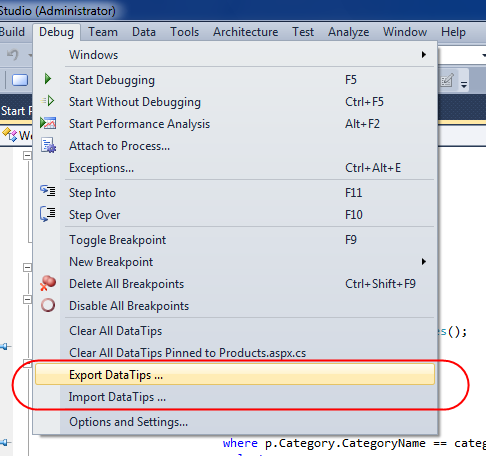 VS 2010 also now supports importing/exporting pinned DataTips to XML files – which you can then pass off to other developers, attach to a bug report, or simply re-load later. Combined with the new support for importing/exporting breakpoints, this makes it much easier for multiple developers to share debugger configurations and collaborate across debug sessions.